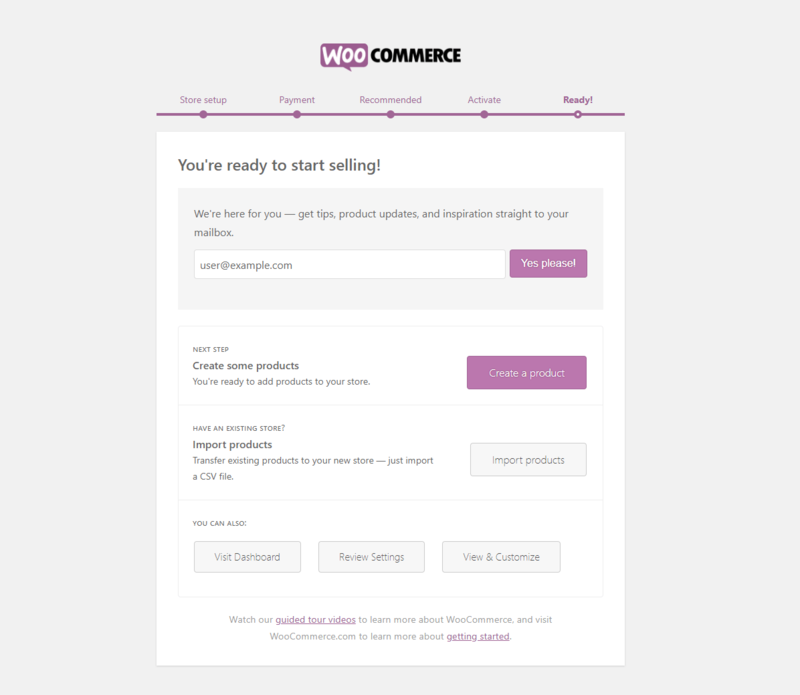 The WooCommerce Setup Wizard is designed to give you a speedy basic online store setup. You’ll still need to go into the settings later to fine tune your store. Creates a set of default WooCommerce store pages, such as the shop, cart, checkout, and my account pages. Gives you the option to install certain recommended plugins, such as a Mailchimp integration plugin, and Jetpack. WooCommerce themselves have a pretty detailed walkthrough of the steps in the Setup Wizard, but we will cover the basics here with screenshots. 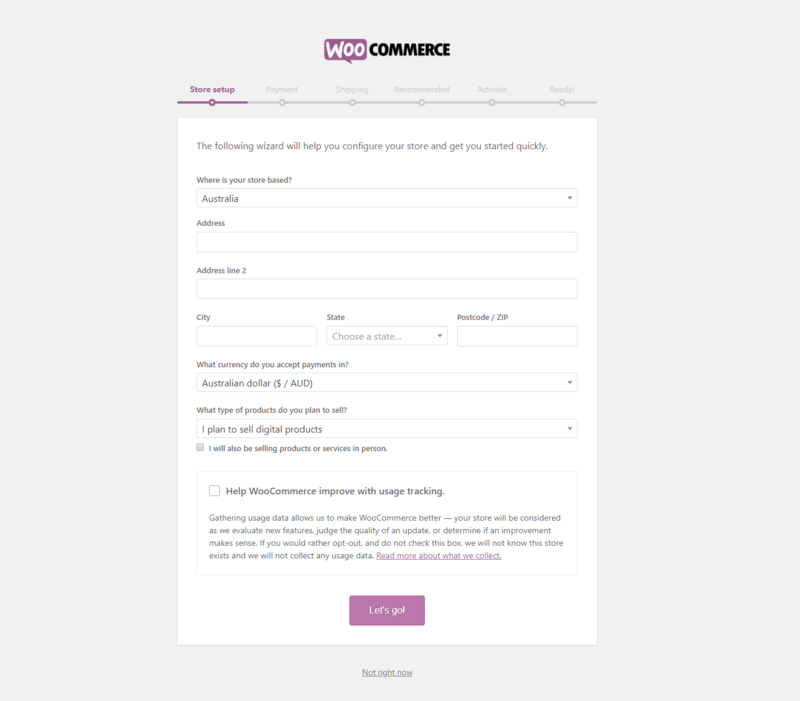 After you install and activate WooCommerce, click the WooCommerce tab on the left and you should see the option to run through the Setup Wizard. If you don’t see the Setup Wizard option, select the WooCommerce tab, press Help on the upper right hand side of the screen. Select Setup Wizard and press the blue Setup Wizard button. Fill in your details: address, currency, what you plan to sell. The address should be the address of your store, not your own personal address (unless they’re the same thing, of course). In any case, this should be your business address. We generally untick usage tracking, but that’s personal preference. Then hit Let’s go! Enter your payment preferences and select Continue. The payment options will vary depending on your location and whether or not you’re selling physical products as well as digital ones. You can also select offline payment methods such as cash on delivery, bank transfer and checks. The Recommended page page is simply recommended plugins, which you can install yourself later anyway, so it’s fine to skip this step. Remember, the great thing about WordPress and WooCommerce is that there’s thousands of plugins to help you do whatever you want with your site. As you start setting up your store, you’ll think of things you want to add or change and that’s when you’ll go and find the plugins that are valuable to you. Plugins are developed by different people using different methods and so can conflict with each other – it’s rare, but one simple plugin update could break your site and you’ll have to uninstall each plugin to figure out which one it is. None of these optional plugins are necessary for you to run your online store, and you might be able to find better options elsewhere. We recommend searching the WordPress Plugin Repository as a starting point. You can access all the plugins in the WordPress Repo under add plugins in your WordPress Dashboard. The last step gives you the option to install Jetpack. 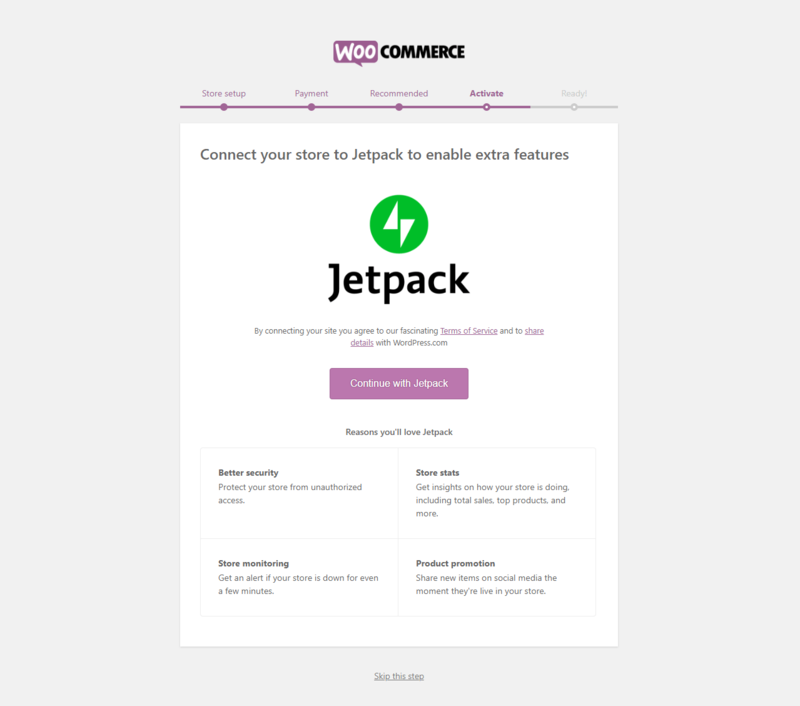 Jetpack is a plugin made by the same company that runs WordPress and WooCommerce. You can have a look at their site here. Personally, we would skip this step because we don’t need all the features that Jetpack offers. We generally use other plugins for things like statistics and uptime monitoring. But again, that’s personal preference. That’s the setup wizard done. You can enter your email to get updates if you like. From here, you can go back to your WordPress Dashboard and go to the products tab to add your products or the pages tab to start creating your unique pages, such as About Us, Contact Us, and your Terms and Conditions. 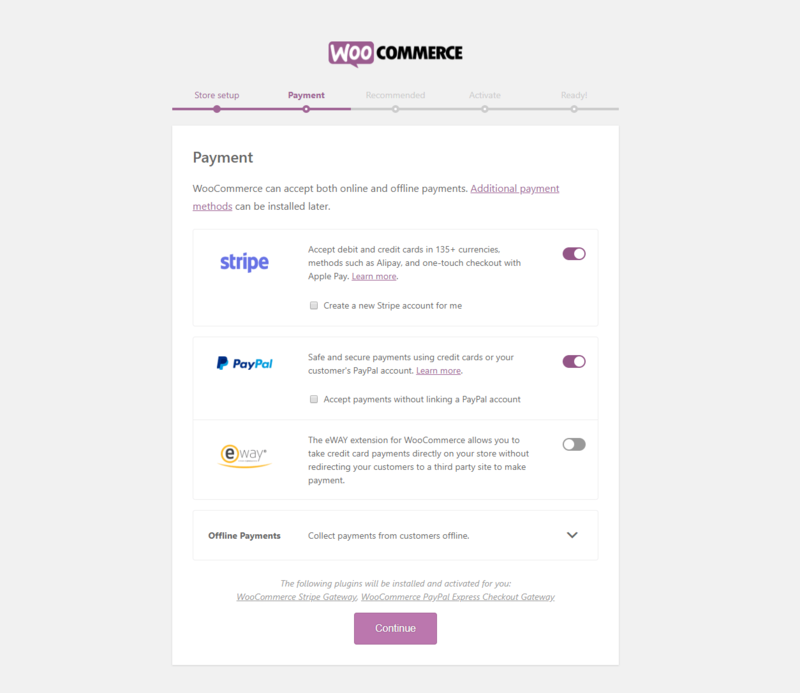 If you prefer to skip the Setup Wizard completely, or if you want to know how to edit any of these settings afterwards, we’ve written another post about the WooCommerce General Store Settings as well as the WooCommerce Product Settings.